New York’s bike polo crew hasn’t done very much to create an image for it’s loosely united club. And by that I mean we don’t have stickers, t-shirts, patches, jackets and things like that. We do have a core group of truly top notch players that aren’t afraid to travel 15 to 20 players deep and win big tournament. We do have a website, New York Hardcourt. And we do have a logo, as seen below. This logo has only been used for the spokecards and t-shirt art for the ESPI 2 in NYC. The concept for the art was my own, and the design was done by Brad Baker of Trackstar. As Montana and others make headway into the world of making hardcourt bike polo a real sport with it’s own governing body and stand alone World and Continental Bike Polo Championships. So will New York’s bike polo crew, in trying to create an image and an official name. It’s almost certain that the logo will be the Statue of Liberty art, or a variation of. And the name may end up being NYC Bike Polo or New York Hardcourt since these are the two URL’s for the clubs website. But the official name of the club is still up in the air, and suggestions are being considered(as far as I know). If you are a New York player and have any ideas for the club, now is the time. This entry was posted by Doug D on November 9, 2008 at 1:01 am, and is filled under Art, Bike Polo, Just One, New York, Photos. Follow any responses to this post through RSS 2.0. You can leave a response or trackback from your own site. Moving from a house to an apt takes a lot of creative organization especially when you have seven bikes, a plethora of parts and seven hundred records. It also requires just simply slimming down on the amount of stuff one owns. I recently had to go through this process. As well as bikes and records, i also have too many T-shirts…a closet full. Mostly messenger/alleycat/polo tees. So I had to take the tees that weren’t in regular rotation and store them. I couldn’t bare to toss them. Anyway my point is, Lady Liberty with the mallet is one of my favorite tees ever! In fact i put it on this morning before reading this post and was delighted at the coincidence. On the note of a club name, here in Ottawa we have always referred to ourselves as the Mallets of Mayhem. 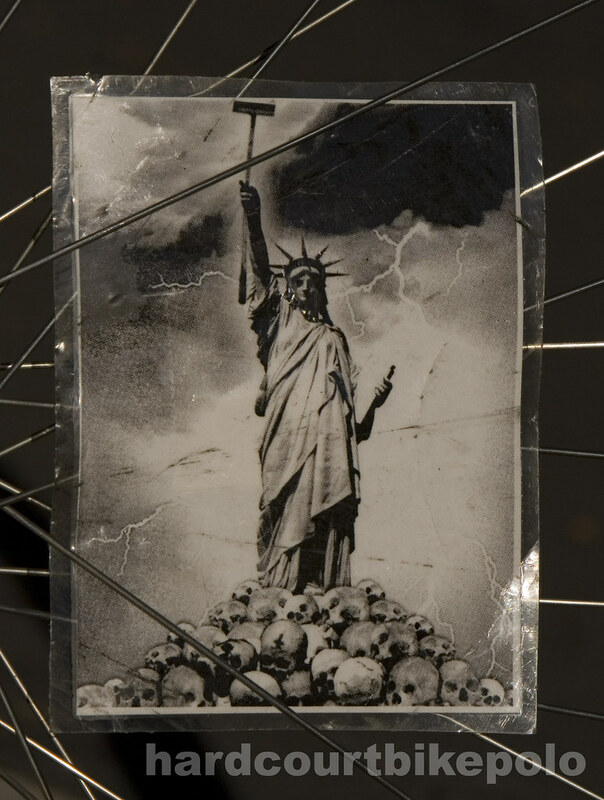 It was shortly after the ESPI NYC, I was sick of always being called “Canada.” We came up with the Skull and Cross Cranks logo, attached “Mallets of Mayhem” to it and told ourselves that the world will know us by that logo and the name that goes with it. Mallets of Mayhem Bike Polo Club, Ottawa, Canada. Someone once asked me if the mallet was a squeegee. hahaha, it kind of does! that’s hilarious. very apropos for new york. Seen. Click image for link.